Radiographs are one of the most important diagnostic tools in veterinary medicine. They allow us to view the shape, size and location of organs inside your pet's body. Radiographs are extremely helpful for diagnosing and monitoring many medical and surgical conditions. X-rays are useful for examining your pet's bones, lungs, heart, abdomen, oral cavity and other areas of the body. An x-ray can detect a fractured bone, tumor, heart problem and locate an obstruction or foreign body in your pet's stomach or intestine. Radiographs are often one of the first tests performed on your pet as the procedure is painless and can often provide an immediate and conclusive diagnosis. Warrenton and Wright City Veterinary Clinics utilize modern X-ray technologies and are up-to-date on the latest radiographic procedures. 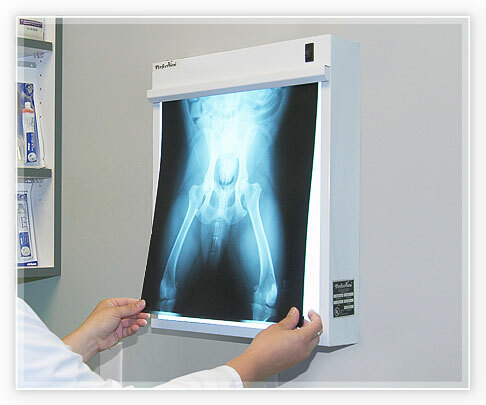 Our clinics take, develop and review all x-rays on-site and results are analyzed on a timely basis. When needed, we collaborate with the UMC Veterinary Teaching Hospital for radiological consultations. 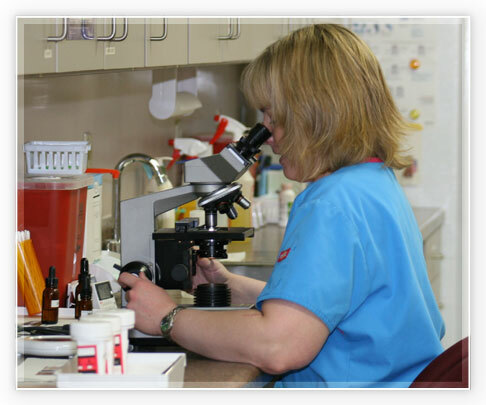 The in-house laboratories at our Warrenton and Wright City Veterinary Clinics are fully equipped with advanced instruments to get us prompt results for your pet. These rapid results often enable us to make decisions about a treatment plan within a short amount of time. We want to start treating your pet immediately, if need be, and this approach also alleviates any unnecessary anxiety for you. Most blood tests can be done during your pet's regular wellness appointment. A complete blood count can be run in a few minutes and can identify signs of infection and inflammation, as well as subtle but life-threatening conditions such as anemia or bone marrow disease. We can evaluate kidney, liver and other metabolic disorders with a chemistry profile. A urinalysis helps to evaluate the function of the kidneys and the quality of the urine produced. Our urinalysis test consists of four parts: examining the physical sample, microscopic examination of the sediment, a dipstick analysis, and using a refractometer to determine the urine's specific gravity. Some problems detected through urinalysis can be remedied simply by changing your pet's diet. Knowing your pet's DNA can be beneficial when it comes to customizing training, nutrition and health plans towards your dog's natural tendencies and behaviors. With a simple blood test we can not only tell you the breeds in your dog's ancestry, but can also give you an ancestry chart where each breed was likely involved. Warrenton and Wright City Veterinary Clinics can process laboratory tests within 10 minutes for Pfizer Heartworm, Canine 4DX, Feline Triple, Parvovirus Snap Test and Giardia Snap Test. We have a working relationship with an outside laboratory for more specialized diagnostic work. These experts typically return the results to our clinic within 24-48 hours.